Herbert Hoover, whose reputation as one of America’s most accomplished administrators and humanitarians led to a landslide victory in the 1928 Presidential election, was the 31st President of the United States. His meteoric rise to the Presidency was tarnished by the economic calamity of the Great Depression. In 1927, Hoover led relief operations during the disastrous Mississippi River Flood. Hoover’s skill at mobilizing private, business, and government resources convinced the American public that there was no task beyond his ability, and propelled him to the Presidency the following year. However, a few months after he entered the White House, the economy faltered and sank into the Great Depression. Hoover went to work with his characteristic energy, but his efforts were overwhelmed by the unprecedented scale of the downturn that lasted over a decade until America’s entry into World War II. As a former-President, Hoover served as an adviser and mentor for his successors. After World War II, President Truman asked Hoover to again lead massive food relief programs. Hoover later headed two commissions, one under Truman and the other under Eisenhower, to streamline the federal government. Most notably, Hoover wrote numerous books including one on his favorite subject — fishing! 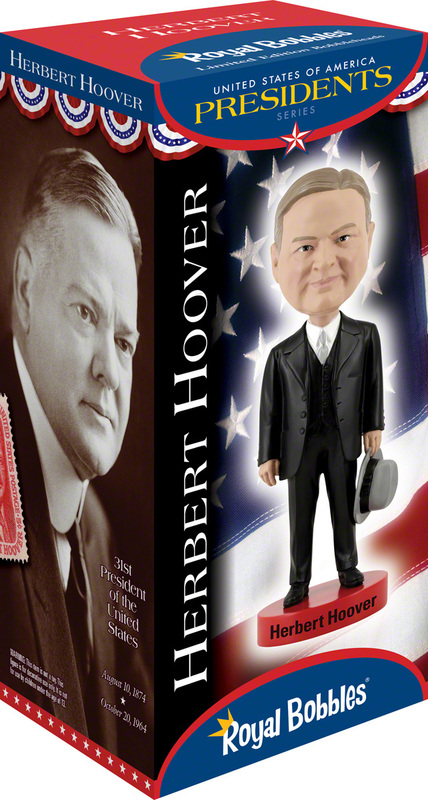 This new updated version of the Herbert Hoover bobblehead features an entirely new head design, to be more realistic.